I want to give you a very brief introduction to the purpose behind Global Health and Childhood Cancer. Practically speaking, it is going to be an interview-based podcast, where I talk to important thought leaders in fields related to global health or oncology about their expertise. Hopefully, this first year I’ll aim to release 1-2 per month. As for me, I am a pediatric hematology-oncology fellow at Texas Children’s Hospital in Houston, Texas with some experience working in resource-constrained settings, and with significant interest in continuing to do so. So, at this phase in my career, I consider myself very much a learner, and I’m excited to explore the knowledge of the experts so that I can learn right alongside you. So, switching gears a bit, let’s talk about the impact I hope the podcast has. The tagline for the podcast is, “discussing the ideas in global health that can save the lives of children with cancer.” That’s…a pretty lofty goal. Do I really believe that podcast discussions, that people merely talking, can help save lives? I really do. And, even more, I believe that you who are listening can play an important part in this work. To demonstrate why I think this is true, you’ll have to indulge me for a few minutes and walk with me through the history of childhood cancer. It might feel like a random detour, but there’s an important purpose for this detour. Let me say up front that the story I’m about to tell takes place in the United States, primarily because I’m most familiar with US history. Many people from many countries certainly contributed to this story, but for the sake of being brief, I’m focusing on just one part of it. Let’s focus on acute lymphoblastic leukemia, a type of cancer of the blood, which we’ll call ALL for short. Leukemia was first described in the early 1800s and no treatments had ever been proved effective until the 1940s. So we can suppose survival for ALL was zero until that time. It was uniformly fatal to every child who had it. In the 1940s, a young pathologist named Sidney Farber at Harvard Medical School in the United States theorized that an anti-folate drug, called Aminopterin, might prevent the growth of leukemia. He gave it to 16 kids with leukemia and found that 10 achieved remission, a feat that had never been accomplished in the history of the world. It’s hard to overstate the importance of this finding. 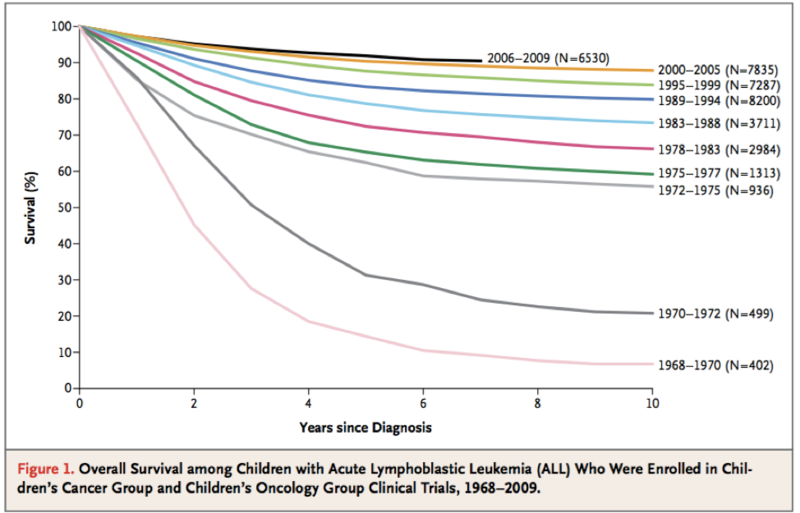 No one had ever demonstrated that a drug could treat leukemia in kids, much less achieve complete remission. For the first time ever, there was hope that this untreatable disease could be treated. “Farber reported these results in the June 3, 1948, issue of the New England Journal of Medicine. Instead of acclaim and acceptance, however, many in the scientific community reacted to the news with a mixture of disbelief and resistance. Part of the reason was cultural. In the entire history of medicine, no drug had proved effective against non-solid tumors (those that involve bodily fluids such as blood or lymph). Frustration was taken as a sign of futility. Many people did not believe Dr. Farber either because conventional wisdom of the medical community said it was impossible, or because no one expected an early-career, unassuming pathologist to be so effective. Yet despite the resistance, his findings started a revolution in cancer treatment that is now enshrined as one of the most important success stories in the history of medicine. People started experimenting with different drugs in the 1950s and by the 1960s the first attempts at what would become modern clinical trials were started. By the early 1970s, oncologists figured out a magic combination of drugs to reliably induce remission and discovered the importance of administering chemotherapy into the fluid around the brain and spinal cord, a place where leukemia would come back after treatment. 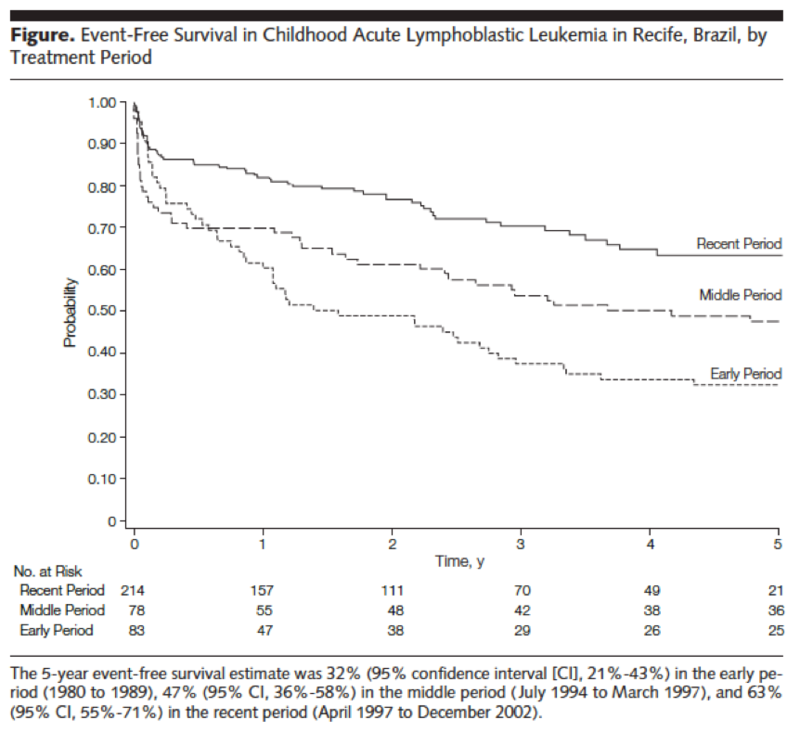 With these treatments, more than half of kids were surviving leukemia. 50%! From 0% not 20 years prior. Further refinements to therapy through cooperative clinical trials have continued, and today, in high-income countries like the United States, we can cure more than 85% of children with ALL. 85%! From 0% in the 1940s and 50s! For an astounding graphical representation of this success, see the survival curve below (figure 1). Hunger, et al. NEJM, 215. So that’s a nice story, right? But what does Sidney Farber’s success have to do with this podcast? Well, I told you earlier this story primarily took place in the United States, and it’s fair to say outcomes in high-income countries similar to the United States have followed this path. In fact beyond leukemia, if you lump together all cancers in children in high-income countries, on average more than 8 in 10 kids survive their cancers. That’s more than 80%! We don’t have time for the stories of Hodgkin lymphoma, Burkitt lymphoma, Wilms tumor, retinoblastoma, and many, many other types of cancers, but they feature similar amazing revolutions. This is the question that I want to explore on this podcast. It is also a question that oncologists are not well equipped to answer. We specialize in biology, chemistry, genetics, and clinical medicine. But the answers to the question, “How do we get treatment to kids?” require insights beyond biomedical science. It requires input from public health, economics, political science, sociology, psychology, and a host of other disciplines. This is a big, complex, multidisciplinary problem because it is fundamentally a human problem. The causes of the problem, and therefore the answers, come from the very foundations of what it means to be human and to cooperate with others in society. But, just as Sidney Farber was met with resistance and disbelief, not everyone accepts the answers to this question. Many people think that providing complex care in resource-constrained settings is impossible. The historical futility of attempting such a thing continues in many people’s minds up to the present. Also, many may underestimate the capabilities of a group of hard-working people in low- or middle-income countries. Complex subspecialty care is not something many associate with these settings. But here’s the thing many people don’t know. Revolutions of the same magnitude and importance as the one Dr. Farber started have already happened in many places around the world and are happening right now. People just aren’t aware of it. These quiet revolutions have transformed how care is provided to kids in many countries, and have saved countless lives. Let me give you an example of one of these quiet revolutions. From 1994 to 2002, Dr. Francisco Pedrosa and his colleagues from in Recife, Brazil partnered with Dr. Scott Howard and his colleagues from St. Jude Children’s Hospital in the United States to improve the care provided to children in Recife. They undertook a program of educating doctors and nurses about oncology care, improving supportive care practices, increasing resources available to families, and protocolizing therapy. With these improvements, patient survival doubled, increasing from 32% to 63%, in 8 years! Survival doubled in 8 years! And they demonstrated it could be done at a fraction of the cost of high-income countries. If a researcher developed a new drug that demonstrated those kinds of results in 8 years, not only would jaws hit the floor, but it would be the next billion-dollar blockbuster. Take a look at the survival curve below (figure 2). Howard, et al. JAMA, 2004. This is just one example of the many amazing stories that could be told about medical providers working in countries all over the world. In fact, we’ve had decades of successfully proving cancer care in resource-constrained settings. There are many people who have presided over revolutions in treatment every bit as effective as the one Sidney Farber started. This isn’t always acknowledged because many are focused on answering the question of the first revolution, “how to treat kids” without seeing the importance of the current, more pressing question, “how to get treatment to kids”. The reality is that we need people to answer both questions. It’s a good thing to work toward a day when every child with any cancer anywhere in the world receives an effective treatment for their cancer. To do this, we still need better treatments for many types of cancers. This requires research and funding in biology, genetics and pharmacology. But at the same time, we need to get the resources to kids with cancer that we already know how to treat. As I mentioned earlier, this requires a broad, multidisciplinary effort. This podcast is dedicated to answering this second question by bringing together these various multidisciplinary perspectives in conversation. Thanks to the efforts of dedicated people around the world, we now know a lot about how to provide complex-care in resource-constrained settings. There is, in fact, a robust body of literature on the topic. And yet improvements across countries have been uneven, and similar questions still plague many places – “What drugs are essential for adequate care?”, “how do we increase the amount of resources available to support and treat patients?”, “how do we adjust treatment intensity given the unique context of a center?” Since many people have grappled with these exact questions and have useful insights from their experience, it is important that people with similar questions hear their ideas. This podcast is dedicated to amplifying the voices of people with important things to say, so that their ideas can improve the care of kids in other places. And now, finally, we come back to the question we began with – Why do I believe that discussing ideas can save the lives of kids with cancer? Because it’s people with ideas who have transformed medicine. Sidney Farber had the idea that systemic treatments with certain drugs could cure leukemia, something that many people thought impossible. Yet this simple idea kicked off a revolution in treatment. In the same way, people around the world with ideas about how to improve care, from Brazil to Guatemala to Egypt to Malawi to India have not only transformed the care provided to their patients, but saved countless lives. The field of global oncology is bursting with these stories, and as people spread their ideas further, there will be many more similar stories in the future. Hopefully, it’s abundantly clear that we can’t do this without you. Do you have a story to share of how care has been improved in your setting? Contact us! Our email address is Info@GHCCpod.com or visit our website, www.GHCCpod.com. There you’ll also find transcripts of the shows and can leave a comment if you something to say! You can subscribe to the podcast on most major podcast apps including Apple podcasts or Google podcasts. If you like the show, consider leaving a review on iTunes, which helps us get discovered by others. Also, consider sharing episodes on social media or with your friends. Any recognition helps. 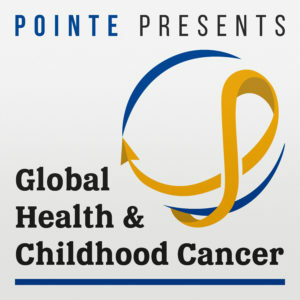 GHCC is brought to you by cancerPOINTE, which stands for Pediatric Oncology International Network for Training and Education (a mouthful, we know, which is why we just say cancerPOINTE…). We are an organization dedicated to promoting global childhood cancer education. We have a website – www.cancerPOINTE.com – where you can find information about training programs, expert consultants, and other resources to support the education of medical providers in resource-constrained settings. We are always looking for resources to share or for people to get involved with our work. If you’d like to contact us, you can email us at Info@cancerPOINTE.com, or search for us on Facebook, Twitter, Instagram, or LinkedIn. Lastly, if you’re interested at all in global pediatric oncology, go join the International Society of Pediatric Oncology (SIOP) over at www.SIOP-Online.org. They have an entire section dedicated to Pediatric Oncology in Developing Countries (PODC). You can join a working group and get involved! Alright, that’s all I’ve got. Thanks for listening. Hope to talk to you soon!